Please refer to this map for the areas considered as part of the south in this poll. i couldnt fit some of the states that are contested as being part of the south, but if Virginia, Kentucky, West Virginia, or Maryland is your favorite feel free to post that. I'd be likely to call Virginia part of the South before I'd say that Florida is. Although cities like Tallahassee and Jacksonville are Southern to the core, once you get to Orlando and Tampa, Florida stops being part of "The South" and becomes a region all of its own which just happens to be located in the south. I am biased. Florida all of the way for me! well im meaning location and heritage, i cant exactly leave florida out. You need to look at what up calls southern, and put THOSE states in your poll. Of course, I'm biased, so I'll say Florida. The landscape, the beaches, and the urban growth here, lead the Southeast and was an important factor in me not leaving the state to relocate to Virginia when I had the chance too. Other than Florida, I'd take Virginia at No. 2 and Texas at No. 3, as my favorite Southern states. I would vote for Arkansas, but can't you edit the post and add Oklahoma, ? D.C? D.C. would be my third, after Arkansas. edit: I lost my mind, and said texas was third, not arkansas. Could whoever made this edit their poll and add Oklahoma? Even I don't consider Oklahoma that southern (I compare it more to Kansas, Nebraska. True it borders Missouri, Arkansas and Texas but even those states (just like the other posters comments about StLouis being a Midwestern city not a southern city on another thread) aren't considered southern to the scale of a Mississippi or South Carolina by some. To me its kinda like considering Pittsburgh a New England city because parts of New York state have that distinction and Pennsylvania borders New York . 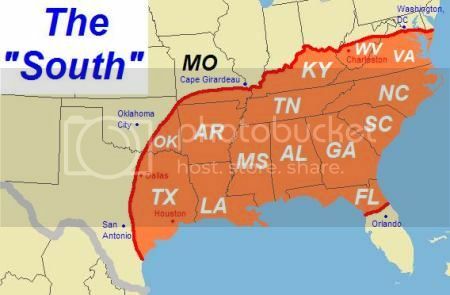 . . eventually the southern states turn into the southwestern or prarie states and to me its somplace in Texas, Missouri and Arkansas where that happens. When you think "southern" you think Charleston SC or Savannah GA, you could make a case that Beaumont or St. Louis or Ft. Smith fits those profiles but Oklahoma City? Tulsa? Sorry doesn't work for me but thats just my opinion. Florida for me. Miami to Pensacola, it's all good to me. I would probably chose coastal GA or SC if I had to move somewhere else in the South, but NC would be my second favorite. I would've chosen Florida, but most of Florida's greatness isn't in the "southern" parts of the state. Sure, northeast FL is becoming great, but most of Florida's renowned areas are south of Orlando, and South Florida can't be considered part of "The South" IMO. I chose north carolina as well, i love it. Since I don't agree with the map, I still consider all of Florida to be southern. The citizens of South Florida communities like Lake Wales, Belle Glade, Clewiston & Homestead (South of Miami, btw) will look at you crazy if you tell them they aren't southern. On the other hand, its hard to group a historic dense and urban waterfront city like New Orleans, Richmond or Charleston, with a landlocked suburban oriented city like Atlanta or Knoxville. Everything from their culture, the popular local foods, the built environment and the natural landscape are completely different. If you don't consider Central or South Florida southern, then there's no way cities, in the orange portion, like Hilton Head, Asheville, Norfolk and Myrtle Beach are either. What makes Oklahoma southern is everything, I think. Building styles, especially the new houses (everything is brick, with a tinge of victorian) weather, hot summers, mild winters, and growth. Low costs of living make it southern, everything points to the south in Oklahoma. A person who says Oklahoma is not southern does not have the right, or expertise, to comment on the Sooner State. Speaking of Sooners, Oklahoma's status as the biggest football state in the union makes it Southern. Oklahoma is 80 percent Southern Baptists, and is the buckle of the bible belt. That makes it Southern as well. Statistically, it is Southern as well. It has a large indian population, confirming it's identity as well. i dont exactly with agree with the map relating to florida either. i think all of it is southern, im just using the map because it simplifies the polling process and i dont know enough about the other states that are part orange to comment on them or leave them out of the poll. I think I might agree with fruit cove. Gotta go with NC, and Texas as a close 2nd. If you've never been to Austin, make it there and you will get that "My God, I could live here" feeling. Lakes, hills, tolerant views, and great street life! Tolerant views are often a misconception, IMO. If it is a must, avoid heading north, up I 35. heaven forbid you enter Dallas, or even worse, probably in your opinion, America's worst and least tolerant city, Oklahoma City. Don't keep going. You go through America, which is a bad thing. Get on that I 69 thing when it gets built, and shoot yourself up to Canada. Or try the Austin airport, if you don't want to go through the Heartland. edit: Most of that post was extreme satire and sarcasm, no offense was meant. Well, I live in Boca Raton, in the Ft. Lauderdale/West Palm area, and it's like a different planet, compared to Jacksonville or Pensacola. There's so many New Yorkers down here (nothing against yankees) that it just doesn't feel like "Good Ole' Dixie" lol. Isn't your new sig a little big? However, if you leave the city and drive to the West side of Palm Beach County (Belle Glade) you'll feel like you're in the heart of Dixie. Or take US 1 south from Miami to Homestead or Florida City, you feel right at home, if you like "Dixie" too. Likewise, West Jacksonville feels very Southern, the city core feels Midwestern, the Southside feels like Central Florida and Ponte Vedra feels like Palm Beach. With so many people living here, because of the military, its impossible to give the entire city of Jax the Dixie label as well. Its just to confusing to blanket an enitre region based on "Old South" or "Dixie" characteristics. I just dont see how u guys can take away big piece of Florida to compare it with other Southern state. Last time I check, the entire of Florida is still in Southern USA, regardless how u want to say it, the entire state of Florida is South. Quit making up culture border or anything to exclude that. Geographically, it is south and it is a fact.